The trustees of the Bernie Grant Trust, invite you to the 2012 Bernie Grant Memorial Lecture. Unsurprisingly, given events in recent months, the subject will be the key issue of the future of policing. The past year has seen unprecedented tension on our streets, underpinned by ongoing dissent on police Stop and Search practices, and more recently concern about the unhealthy relationships between the Police and the Media. .
We are delighted to welcome David Gilbertson, a former senior police officer in Tottenham and the Metropolitan Police, and HM Inspector of Constabulary, who will deliver the lecture. David worked closely with the late Bernie Grant MP on improving police and community relations in the past and holds the Queens Police Medal for distinguished service. He draws on decades of experience in policing, and with a reputation for plain speaking, his lecture promises to challenge the direction of policing in the UK. An audience debate on the issues raised in the lecture will follow, with a panel chaired by Rt. Hon. Keith Vaz MP. We very much hope that you will be able to join us for this important event. 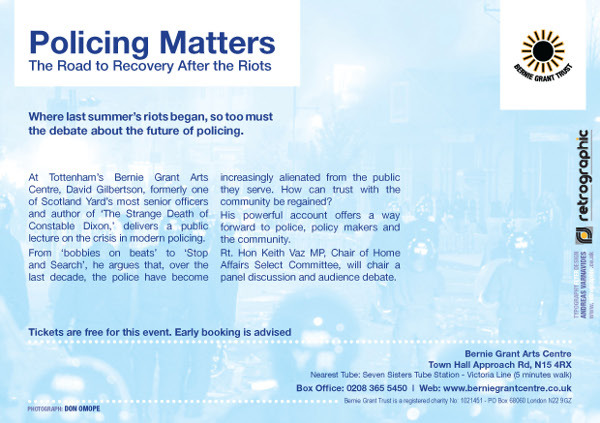 As we expect a high level of interest, please let us know you will be coming by RSVP to berniegrantlecture@hotmail.co.uk so that we can reserve your seat(s). Secretary, Bernie Grant Trust "